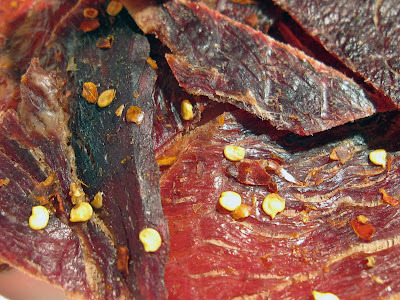 Cattleman's Beef Jerky is a brand of KMB Foods, Inc., based out of Arcadia, CA. KMB Foods owns other brands, including Pacific Coast Jerky Factory, and Cactus Jacks. KMB Foods also has a big private labeling business, making jerky for several different brands. They also manufacture proprietary recipes for other jerky brands as well. This particular jerky from their Cattleman's brand uses a different type of meat that I haven't seen from them before. It's a slab-style cut, but cut more thin, and is very flexible. I've seen a another slab-style cut they use that's more rigid, and almost black in color, which I've reviewed from their Pacific Coast Jerky Factory line, and another brand called Mt Shasta's Finest. Beef, teriyaki sauce, brown sugar, water, garlic powder, black pepper, onion powder, red crushed chile, cayenne, liquid smoke, sodium nitrite. The first thing I taste from the surface is a light sweet flavor and a faint chile pepper flavor. With some sucking I can pick up a light saltiness. Not long after that, a little bit of heat comes through. The chewing flavor offers very little of anything more, just more of the surface flavors. For being labeled as "Hot", this jerky has a little bit of heat, but I don't think it holds up to being called "hot". Even though I've developed a tolerance for hot foods, there's no more heat in this than a packet of hot sauce from Taco Bell. I still see this as "mild" on my hot scale. There's just a tingle of spiciness on those pieces with more chile pepper flakes. But there is a fair amount of chile pepper flavor in this jerky, which I do enjoy. I wish there were more, because there isn't a lot to enjoy in this jerky. Aside from that chile pepper flavor, I can sense some sweet from the teriyaki sauce, a light amount of saltiness, and maybe a faint bit of teriyaki flavor itself. That's about it. There's something of a meat flavor in this, but not anything that I would enjoy. First of all, it's a light flavor. Second, it's a stale, old flavor, as if some of the fatty tissues had spoiled. Overall, what you're going to notice is a light teriyaki flavor with a light sweetness and light saltiness. You'll get a fair amount of chile pepper flavor, but only those pieces with enough chile pepper flakes, and a weak chile pepper heat. It's not really hot, as the package label indicates. These are slices of whole meat, sliced slab style, and sliced thin, and in small to medium sized pieces. It's a dry jerky, with a dry surface feel. The pieces have an elastic, flexible consistency. Tearing pieces apart with my fingers seems easy to do. Chewing is moderately easy, but some pieces require some effort. The chewing texture starts out feeling rubbery, with a good deal of chewing resistance. After several chews, it takes on a mushy feel with some gummy consistency. Once chewed down to a soft mass, it's mostly just mushy. I found several pieces with some hard, unchewable tissues. I also found some pieces with gristle, and some pieces with chunks of fat. As for clean eating, it's very clean, leaving no residue on my fingers, and no meat fragments on my lap or desk. I paid $10.99 for this 10oz bag from a roadside fruitstand in Pala, CA. That works out to a price of $1.10 per ounce. 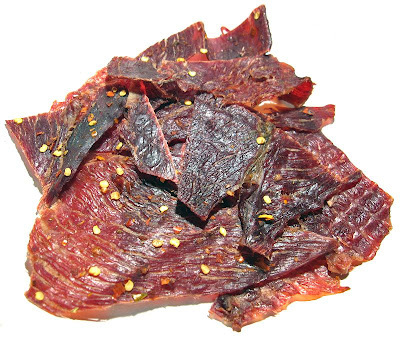 For general jerky snacking purposes, at the $1.10 per ounce price, it's a fair value. I actually don't get much snackability from this, however that's a cheap price for jerky when you consider the national brands like Jack Link's or Oberto will run you about $1.75 to $2.00 per ounce at the grocery store. It's subpar jerky at a cheap price. As a "Hot" beef jerky, at the same $1.10 price per ounce, it's also a fair value. Again, you're getting what you pay for with this brand. It's not really hot at all, and I should be disappointed with this. But, the cheap price might be enough to call it a "fair" value. 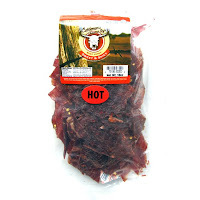 This Hot variety from Cattleman's Beef Jerky is not really hot at all, and doesn't really have a good taste. It's not so bad that I can't tolerate it; I can eat this without cringing. But, I wouldn't eat this if not for the fact that I'm writing a review. There's a stale, old meat flavor that's actually light, but still noticeable enough that I can't ignore it. Had the other seasonings and flavorings been stronger, it probably wouldn't have been noticeable. But as it is, the overall flavor is light, allowing that old meat flavor to show through. The only positive I can find in this jerky is that it offers a fair amount of chile pepper flavor, just not much chile pepper heat. The meat consistency is poor, with a lot of unchewable tissues, a fair amount of stale-tasting fat, and a chewing texture that feels mushy. For my recommended beer pairing, go with something with a strong flavor, like an IPA or an imperial stout. Is this jerkey gluten free?